Power: Thanks to the Javelin's length and long casting ability of the Chronarch MGL, I constantly found myself in position wondering if I cast too far to make an effective hookset. 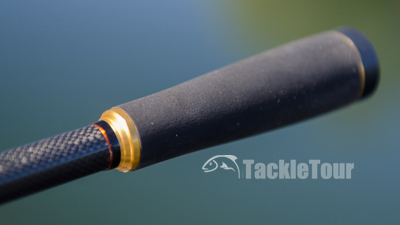 Fortunately, the rod's extra length not only helps with launching baits, it ensures you can move enough line on each swing to drive the hooks home if and when a fish bites. 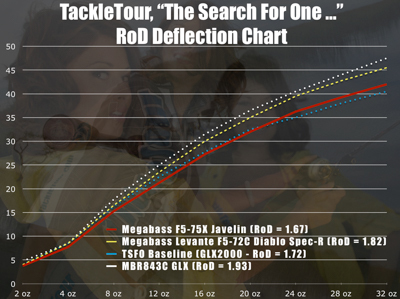 Fig 1 : The chart above illustrates the deflection characteristics of our Megabass of America F5-75X Javelin against our baseline all purpose sticks. I was pleasantly surprised on several occasions but none more so than when I made a long cast with the iJack and was faced with a "professional overrun" I needed to address before I could begin working the bait. This particular overrun required several minutes of attention before I could clear it and just as I did, an angry bass hit the iJack floating out in the middle of no where. 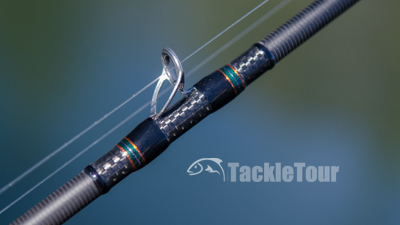 I quickly spun the handle of my Chronarch MGL to take up as much slack as I could and as soon as I saw my line straighten out, I swept the rod tip back almost certain the fish was already gone, but was surprised when I felt resistance when I was about 80% done with my swing. I didn't think I that was enough, but a minute or so later, I was proven wrong when the fish was in the boat and ready for the camera. The back portion of the split rear grip is EVA foam. Design & Ergonomics: For a 7'-5" stick, the F5-75X Javelin feels pretty light in hand. In the lab, it measures at 5.1oz in weight which is what I'd consider average for its length and power. 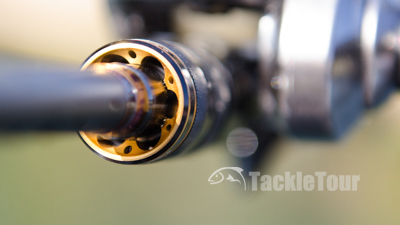 The rod's balancing point is on the plus side of average at eight and a half inches up from the mid-line of the reel seat but its balancing torque of 0.23 tells us it's somewhat tip-heavy. I must have been fishing it with the tip down the majority of time, because I didn't get this sense while fishing the rod. This is why we conduct our evaluations both in the lab and out on the water. 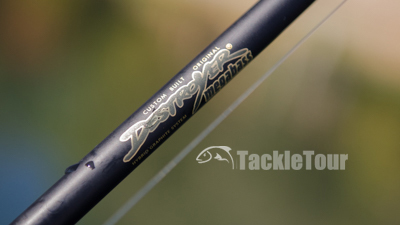 Aesthetically, we already discussed the rod's handle design and the key Megabass design features. While I do miss the days when each Megabass Destroyer rod featured a different handle design, I do like how the Javelin's came together. Granted, my preference would have been for the rear handle to be either all cork or all Eva, and not a mix of the two, but it works. The stripper guide is double footed and features a little extra flair at the wrap. Price & Applications: The Javelin is worthy of that traditional "medium heavy" power rating and a true contender in our Search for One campaign. Its 7'-5" length only helps with its versatility and its mod-fast taper make it a great choice for moving baits yet its sensitive and powerful enough to fish jigs and Texas rigged plastics as well. It's an excellent pitching stick. Top view of the Ito Headlock System reveals exquisite detailing inside the lock nut. There are a couple high end rod series on the market that are priced aggressively. Megabass of America's 2017 Destroyer line is one of those series. I still can't believe this series is priced more or less at the same price point as when I first sampled a Destroyer rod back in 2004. I paid roughly $450 for the F7-711X I fished back then and that was before shipping from Japan. 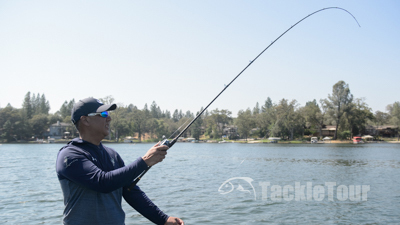 Today, you can order the Javelin for $399 from TackleWarehouse and get free shipping and warranty support from Megabass of America. Megabass of America's '17 Destroyer lineup features JDM style with USDM actions. The Javelin is a 7'-5" medium heavy powered all purpose stick. Conclusion: You know how you feel a certain connection with some products? That's what happened when I made my very first cast with the F5-75X Javelin. My first impression when picking this stick up was it might have been too long for an F5 power and I was dubious as to how that length would play out. Don't get me wrong, I like sticks that are around 7'-6" in length but usually beginning with a heavy power rating on up (Megabass's Orochi X4 F6-72X6 Destruction, Kistler's Original Helium He76HC). Megabass of America did an excellent job working things out with the Javelin, and after a while, I forgot I was fishing a stick this long - until it became time to set hook of course. It quickly became my favorite stick to fish over the last year and I continue to find any excuse I can to fish the rod. In fact, in the spirit of getting more reviews done, I've had to leave it at home on a few testing trips knowing that if it's on the boat, I'm reaching for it. If you're new to Megabass or just new to Destroyer, and you're looking for one rod to give you the true Megabass experience, my recommendation is to pick up the F5-75X Javelin. Looking for a Megabass of America F5-75X Javelin?